"Had every Athenian citizen been a Socrates"
I'm back from a fantastic experience at RavenCon. It was lovely to catch up with my friend estellye and see her gorgeous paintings in the art gallery, and to see Gray Rinehart again. I also got to meet vg_ford in person, which was terrific - she Tuckerized me in her new book Dark Moon Seasons, which was just published - and I was also pleased to meet m_stiefvater, madkestrel, James Maxey, and many others, including the Author Guest of Honor, the wonderful Jack McDevitt. My panels and presentation went well, I think; I was very happy with the attendance, comments, and feedback. While at the con, I recorded three segments for the upcoming episodes of the Quoth the Raven podcast: a dramatic reading of Edgar Allan Poe's "The Premature Burial," an interview about me and my work, and a joint interview/discussion with Jack McDevitt. I also got to see a very witty performance of "Harry Potter in 45" by the comedy troupe Luna-C. (That's all seven Harry Potter books in 45 minutes. Very clever stuff.) My next con appearances are ConCarolinas and Anticipation/The 67th WorldCon. 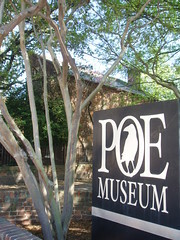 During my travels I also made a pilgrimage to the Poe Museum in Richmond, which was thoroughly captivating. You can see my photos here. 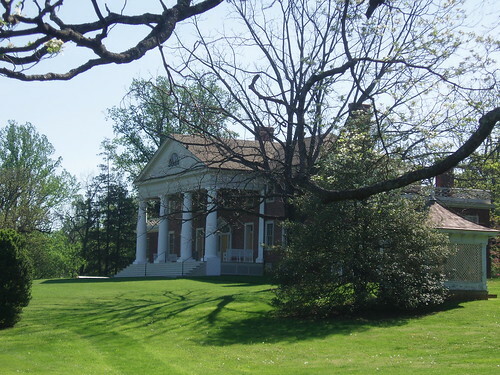 I also spent some time at Montpelier, the home of James and Dolley Madison, which I had not visited since the architectural restoration was completed on September 17, 2008. It's come a long way since my graduate school days and the era when I was writing about Madison. Madison's been one of the most important figures in my intellectual development and historical study since I was in high school, and I was thrilled during this trip to get a chance to look at the current excavations and even visit the archaeological lab while work was in process. More pictures from Montpelier are here. Now I need to change hats and prepare to speak tomorrow to the students at Oakwood Elementary School about the Trail of Tears, underscoring the recent (and excellent) "Trail of Tears" segment of We Shall Remain. I look forward to catching up with all of you, my friends! "Had every Athenian citizen been a Socrates, every Athenian assembly would still have been a mob." Yay for the Poe Museum! I wish I could've taken pictures inside the buildings. It was fantastic. Awesome! So glad you had a wonderful time! Thank you so much! I did indeed. Speaking of Poe, There's was this mini-series I watched just the other night called Le Portrait de Petite Cossette. Though the creative staff was going for a general Gothic feel, it really oozes Poe-ness. I'll be going into further detail in my LIvejournal enrty for tomorrow when I've absorbed it fully. Justin of Mutant Reviewers From Hell went to a convention with his dad, not warning him about what to expect. "Some Japanese Anime That You’ve Never Heard Of" = LOL! Best of luck with your presentation tomorrow. Elementary school is an uncommon forum for you! The kids should be lots of fun, they are so interested in everything. It was indeed very successful! I had to miss Jamestown, but I'm glad I had the extra time at Montpelier (the new excavation's remarkable), and hey - maybe Jamestown will fit in with MarsCon! I'm so glad you liked the quote! Madison's the man. You are, as always, quite busy, dear EH with all kinds of wonderful things. The Poe Museum has an excellent website, to which I have directed students from time to time. I am glad you had a good con with Estellye. I will definitely check out We Shall Remain. Thank you! :) The Poe Museum does have an excellent website, doesn't it? I loved the fact I could download the audio tour to my iPod and bring it with me. The site as a whole is a great resource, and the "real life" museum definitely lives up to its site. I was so pleased that the students to whom I spoke had watched We Shall Remain. The "Trail of Tears" episode had a tremendous impact on them! Glad everything went well for you! Bravo!